Community wireless projects are a major focus of the Detroit Digital Justice Coalition. We support efforts by neighborhoods to organize and build communications systems that increase access to not only the Internet at large, but also local resources. Our future community networks allow us to communicate with our neighbors as well as the rest of the world. Currently, the DDJC is involved in two community wireless projects: HOT MESH in North Corktown and a network-in-progress in 48217. The HOT MESH is slowly expanding outwards from Spaulding Court (rosa parks and perry) to the north, east, south, and west. Read about the first baby steps and later progress. Currently, we’re planning on expanding the network with ten new nodes and two new uplinks, donated by Spaulding Court and the new youth hostel. With Detroit Project Archive and Open Technology Initiative, we’re creating a series of educational tools as we’re developing accessible visual and verbal languages to demystify the process. Samples of these tools can be found here as they are currently being used to drive the community organizing process in 48217. We’re also building out a comprehensive plan to create educational toolkits which turns the complexity of community mesh networks into actionable components. A few weeks ago, I took part in a panel at SXSW Interactive(a surprisingly well-recorded audio feed of the event is available at that link). Along with Adriel Thornton, Diana Nucera, Jenny Lee, and Invincible, I spoke about Detroit’s future media-based economy. I introduced the idea of “media miles” as a technological parallel to “food miles” — sure, we all like avocados and parmesan reggiano once in a while, but shouldn’t we prioritize what we can grow in the back yard? How can we design technology that emphasize local community exchange, in the same way we are designing food distribution systems that do the same? 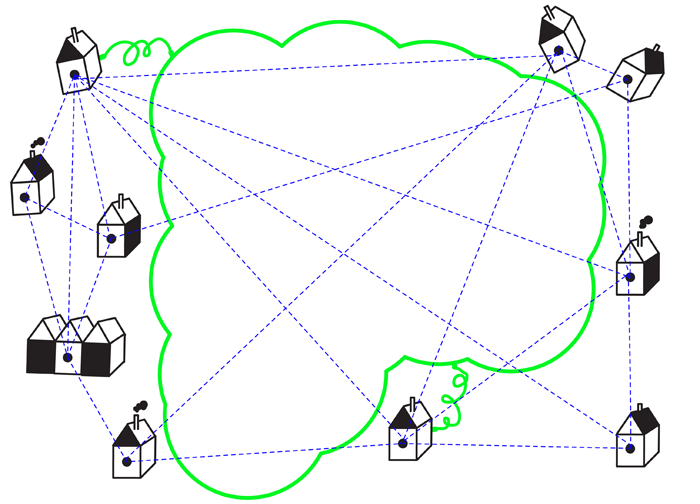 Of course, you know the answer… mesh networks and community internet. I’ll be elaborating on these ideas sooner or later, in cahoots with Nina Bianchi. OmniCorpDetroit, a local hackerspace, hosts community wireless work nights as part of its “open hack night” every Thursday. Benjamin Chodoroff keeps everyone busy with antenna supplies, nodes to flash and test, and manuals to read.